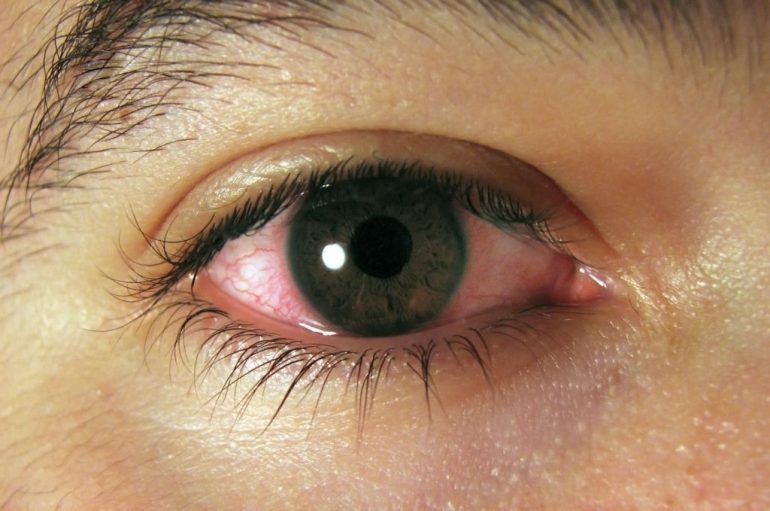 Uveitis is inflammation of the Uvea, the pigmented layer that lies between the inner retina and the outer fibrous layer composed of the sclera and cornea. It is an ophthalmic emergency and requires a thorough examination by an optometrist or ophthalmologist and urgent treatment to control the inflammation. The condition is often associated with other ocular problems making it even more important to know its causes and symptoms. 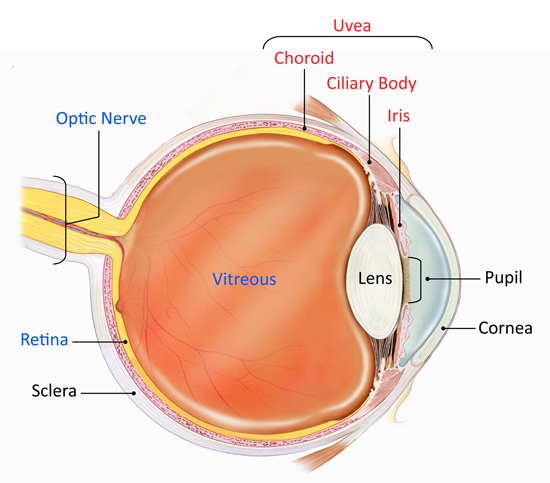 Uveitis refers to inflammation affecting the uvea – the middle layer of the eye. This layer has a lot of blood flowing through it, which allows a large number of white blood cells to be constantly present in it. These cells are responsible for the inflammation. Once the uvea is affected, inflammation also spreads to surrounding tissues such as retina and optic nerve, and by convention, such inflammation is also described by the umbrella term, ‘uveitis’. It needs immediate attention and should not be taken casually. The causes of inflammation in the uvea and surrounding tissues can be broadly grouped as, either infectious or non-infectious. Infections include a wide variety of bacteria, such as those causing tuberculosis or syphilis, parasites such as toxoplasmosis, viruses like herpesviruses, and fungi. Non-infectious causes of uveitis are mostly autoimmune diseases, where the body’s immune cells start acting against its own self. The likelihood of autoimmune disease in the eye is high since the eye is an immune-privileged organ, whereby the body’s immune cells do not get informed about the cells lying deep in the eye. Therefore, if there is any breach in the protective layers of the eye, and the immune cells get access to the inside, which they have never seen before. The immune cells immediately launch an attack against this apparently ‘foreign’ tissue, giving rise to inflammation. One of the most common forms of non-infectious uveitis is associated with a gene called HLA-B27. Other, more serious forms of non-infectious uveitis include sarcoidosis and Vogt-Koyanagi-Harada disease. The most common symptoms associated with uveitis are, pain, redness and/or decreased vision in one or both eyes. Generally, uveitis affects a specific compartment of the eye – the front (anterior), middle (intermediate) or back (posterior) of the eye. When all compartments are affected, it is called panuveitis. The symptoms of uveitis will vary depending on which compartment is affected more. For example, in anterior uveitis, there is more redness and pain, in intermediate uveitis – black spots (floaters) are common, while in posterior uveitis – vision is most affected. Interestingly, infectious and non-infectious uveitis, often cause similar appearing disease. To distinguish between the two, eye doctors first look for unique signs in the eye that may point to a specific cause. Then, they find out if the patient has any other disease that could be linked to uveitis. For example, patients with HLA-B27 associated disease typically have pain in the lower back or other joints, early in the morning, that gets relieved on moving around. Another patient may have suffered from tuberculosis or would have recently come in contact with someone with tuberculosis. Next, the doctor may ask for specific tests, that may help in linking the uveitis to a disease. These could include one or more blood tests, an X-ray of the chest, or some tests on fluids collected from the eye. It is very crucial to find out the cause of uveitis since it will help in deciding specific treatment for the disease. For example, if the infection is found, then specific antibiotic treatment is needed. Once a person is diagnosed with an infectious Uveitis, he will, in most probability, be prescribed with antibiotic treatment. Besides the specific treatment, patients would need some form of steroids for the eye. These could be in the form of eye drops, injections into, or around the eye, or tablets. When steroids are required for a long time, then other forms of medications that reduce inflammation may be advised. Finally, one should be aware of the complications of the disease. If uveitis is not treated or treated inadequately, it can cause blinding complications such as cataract, glaucoma and others. Not only that, sometimes the treatment itself, can lead to complications, in the eye, or in other parts of the body. The weight gain and puffiness of the face, seen after using steroids for a long time, is a common complication of treatment. No surprise, that the visual disability due to uveitis in the general population, has been found to be comparable to diabetic retinopathy and age-related macular degeneration. Timely diagnosis of uveitis (and its cause, whenever possible) and prompt treatment, is crucial to reducing the burden of this disease.